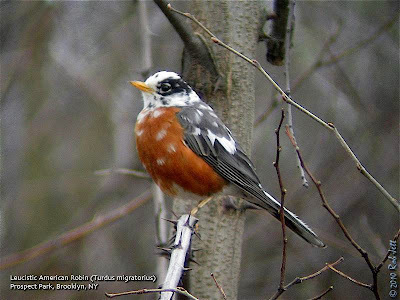 A leucistic American Robin has just returned to his breeding territory in Prospect Park. Each year in late-March this pigment-challenged robin claims his nesting area adjacent to the Upper Pool. I first photographed him in the early Spring of 2008. Over the last couple of weeks migrating robins have begun returning to our area in preparation of the nesting season. This white-headed individual is very specific in his nest preference and can be found in the stretch of small trees and shrubs at the northwest edge of the pond. He also forages at the adjacent hillside beneath a stand of mature elm trees. 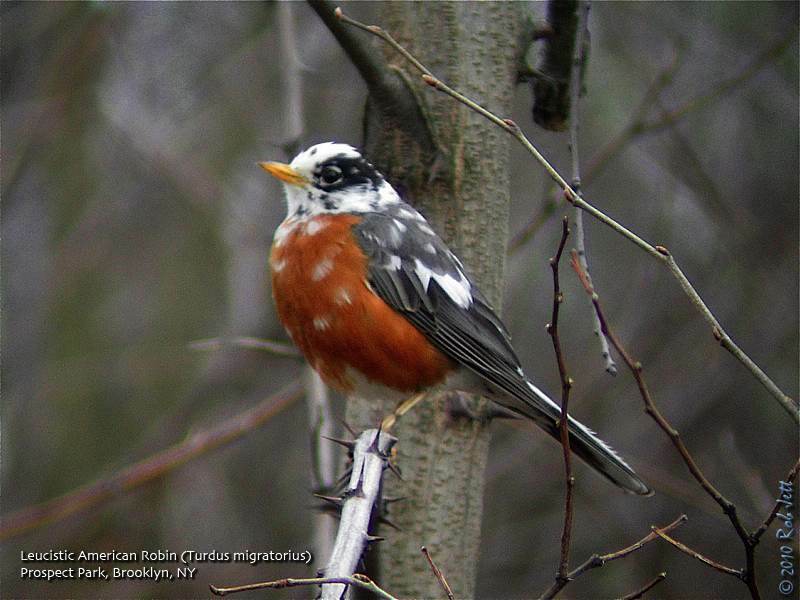 American Robins are short distant migrants and, after the breeding season, may travel as far south as the American southwest, Mexico, and the Gulf Coast. I wonder if anyone south of New York City has photographed this unusual individual during the winter. The old saying, "March comes in like a lion, but goes out like a lamb" seems a little inaccurate this year. There were a few mild days scattered throughout the month, but the weather over the last two days might be better characterized as an angry, rabid lamb on steroids. Despite the turbulent weather, there were signs that the spring transition is moving right along on schedule. On Friday I was able to spend a short time in Prospect Park. Near Grand Army Plaza the Okame Cherry trees are in full bloom, while at the edge of the Rose Garden, Star Magnolias (the first magnolias to flower) have fanned open their white blossoms. 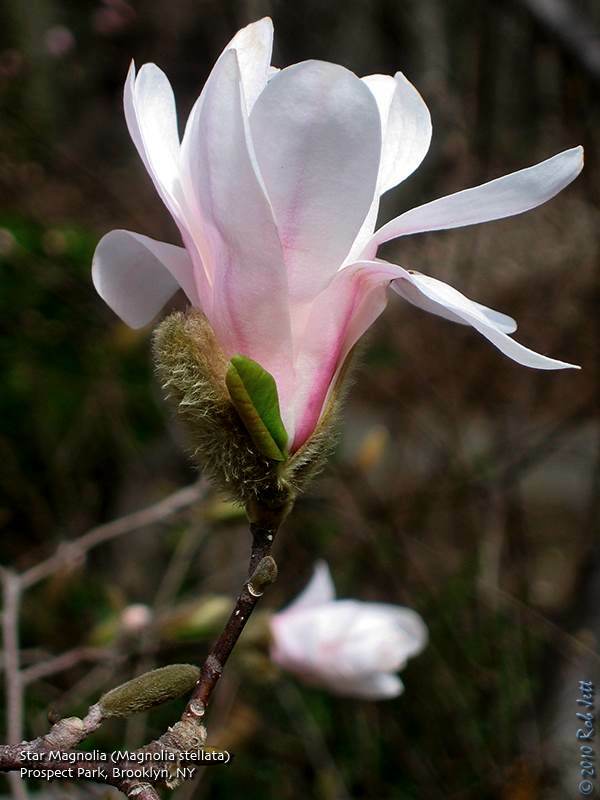 All the other magnolias will follow suit in another week or two. Below the Rose Garden, near the Vale of Cashmere, I followed around an Eastern Phoebe as it hawked for insects from low perches. Phoebe numbers have increased a little over the last week, but we shouldn't see a real abundance of these small flycatchers for probably another month. Both Nelly at the "Nelly's Lawn" nest and Alice at the "Ravine" nest were incubating eggs. I watched Nelly for about 15 minutes and saw her mate, Max, fly to the nest with a meal. She must have been very hungry because she grabbed the fresh kill and took off before Max was seated on the nest. Once at her favorite perch in Elizabeth's Tuliptree, she quickly began plucking her meal of a starling. Mourning Doves are relatively early nesters and I found several nests around the park. One had built a nest at the edge of the Long Meadow right next to the sidewalk. There's virtually no cover for the pair until the young maple they chose for their nest site leafs out. A male robin was perched in the tree above the dove, singing for a mate. The weather on Saturday was sunny, but chilly. I spent most of the day wandering around Green-Wood Cemetery. The wind was blowing in from the east-north-east, so there was little chance we'd see any new migrants. Heydi was hoping to see a Black Vulture and, while I'm always hopeful, in the back of my mind it seemed unlikely. By afternoon the wind had started to move to the south. After checking on Big Mama near Linden Avenue, we sat down at the Hill of Graves and watched the south sky for migrants. A single Turkey Vulture soared passed, following Ocean Hill. We also spotted three Red-tailed Hawks kiting at different altitudes above the cemetery. Could it have been the males from each of Brooklyn's three nests, peacefully sharing their overlapping territories? 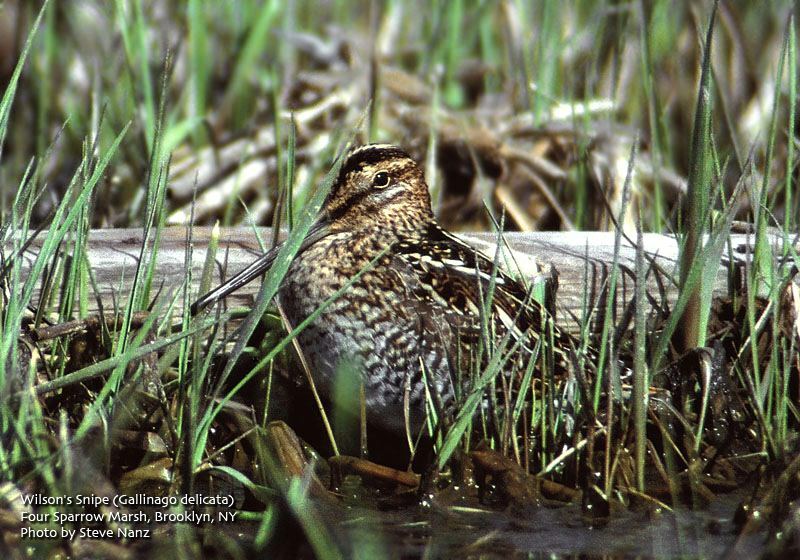 Late-March and early-April is when snipes are migrating. For several years, my friend Steve and I used to go out looking for them on the first weekend in April. We'd travel to several locations around Brooklyn and Staten Island, trying to find as many as possible. I think it began as a joke after a conversation we had regarding the old "Snipe Hunting" prank. The difference for us, however, was that we actually found some of these skittish birds (we didn't shoot them, of course). Anyway, it had been several years since I went searching for snipe and decided that an overcast, drizzly Sunday would be the perfect time to walk around a muddy marsh. I caught up with Heydi at the Marine Park Saltmarsh and we headed over to Four Sparrow Marsh. Four Sparrow Marsh is not a location to explore if you don't like getting wet & dirty. From Flatbush Avenue, it would take a bit of determination to even find the place. If one is persistent and finds the water, there are no trails, or even a hint of any. If one then figures out how to access the marsh and foolishly decides to push ahead, the tide would need to be dead low to get anyway. There is decades of flotsam ranging from planks and docks to boat hulls peppering the mud and marsh grass. It's a perfect location for a wary bird to rest unnoticed. 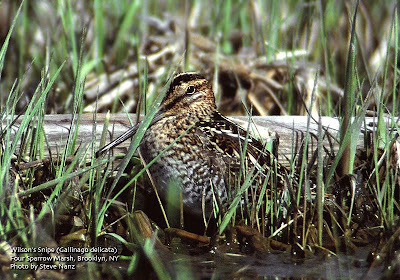 A few minutes into our walk and the first Wilson's Snipe took off flying, several yards to our left. A couple of minutes later, another one. By the end of our walk we had scared up ten. I feel bad that we spooked these birds, but we were never even close to any of them and practically tiptoed through the marsh. I suspect that many just circled around behind us and ended up back where they started. Saturday, April 3, 12 noon to 2 p.m.
A weekly Ranger-led birding walk of the Salt Marsh Nature Trail. On our early morning bird walk we'll be looking for woodpeckers, waterfowl, raptors and much more. Greetings. This is the New York Rare Bird Alert for Friday, March 26th 2010 at 8pm. The highlights of today's tape are SANDHILL CRANE, WESTERN GREBE, PROTHONOTARY WARBLER, TUNDRA SWAN, EURASIAN GREEN-WINGED TEAL and RED-HEADED WOODPECKER. Last Saturday afternoon 2 SANDHILL CRANES were spotted and nicely photographed on a corn field along Seven Ponds Road in Southampton but subsequent visits Saturday and Sunday could not relocate the cranes which have lots of fields to choose from out on eastern Long Island. Conceivably the same WESTERN GREBE seen several times during the winter along the Brooklyn waterfront and off Riis Park / Fort Tilden appeared Saturday off Staten Island at a site where one had visited several times in recent years. This bird occurred in Prince's Bay between Lemon Creek Park and the fishing pier off Hylan Boulevard. The fishing pier parking lot is across Hylan Boulevard from the end of Sharrott's Avenue and the pier provides a good vantage point for scanning for the grebe. This site is just north of Mount Loretto Park. Among the selection of seasonally expected migrants occurring lately was a rather early PROTHONOTARY WARBLER seen briefly on Wednesday at Smith Point County Park in Shirley. Another warbler a little ahead of schedule was a waterthrush heard chipping in the phragmites around Big John's Pond at Jamaica Bay Wildlife Refuge on Saturday. The calendar suggesting this would be a LOUISIANA WATERTHRUSH but the habitat is more typical of NORTHERN WATERTHRUSH. Interesting has been the number of BLACK VULTURES seen in New York City lately. Two were noted last Saturday flying over Great Kills Park on Staten Island and these were followed by 3 over Lookout Hill in Prospect Park on Sunday and on Wednesday 2 appeared over Prospect again and 3 were spotted over Green-wood Cemetery in Brooklyn. It is possible that these sightings involve the same individuals and perhaps are linked to the birds nesting at Fort Wadsworth on northern Staten Island but they certainly are indicative of this species northward expansion. While on Prospect Park recent migrants enjoyed there have featured an ORANGE-CROWNED WARBLER seen again Tuesday near the Lullwater and GREAT EGRET, AMERICAN WOODCOCK, EASTERN PHOEBE, TREE SWALLOW, PINE WARBLER from Saturday FIELD SPARROW, CHIPPING SPARROWS and RUSTY BLACKBIRD. Central Park has received a similar mix including CHIPPING SPARROW on Saturday, 2 PINE WARBLERS on Wednesday and a RUSTY BLACKBIRD in both the Ramble and at the North End. A RED-HEADED WOODPECKER was seen again Sunday at Caumsett State Park north of Lloyd Harbor in the woods west of Fresh Pond which is north of the mansion. Other migrants there featured 5 EASTERN PHOEBES, 7 TREE SWALLOWS and 2 EASTERN BLUEBIRDS. The Eurasion form of GREEN-WINGED TEAL known as Common Teal was seen again at Nissequogue River State Park which is southeast of Sunken Meadow State Park on Saturday. The 2 drakes reported from the pond by southwest corner of the parking lot. Be aware too that hybrids have been in the area recently. PIPING PLOVER was also back at Sunken Meadow Saturday. Out east 2 TUNDRA SWANS and a ICELAND GULL were on Sag Pond in Bridgehampton Sunday along with 2 PIPING PLOVER singles of RED-NECKED GREBE and RAZORBILL occurred offshore. Also on Sunday a BLACK-LEGGED KITTIWAKE appeared off Ditch Plains in Montauk and 2 GREATER YELLOWLEGS and a WILSON'S SNIPE were in the Deep Hollow Ranch in the Roosevelt Sanctuary area. A LITTLE BLUE HERON appeared at Little Reed Pond in Montauk Thursday. Numbers of HORNED GREBES were also out east and elsewhere along the coast lately most in some state of plumage molt making separation from the locally much rarer Eared Grebe more of a challenge. A TOWNSEND'S SOLITAIRE reported early in the week from Mohonk Preserve in Ulster County has not been relocated. It may seem a little early in the migration to monitor songbird movements, but I recommend that you check out David LaPuma's "Woodcreeper". David uses Doppler radar to track bird flock movement in our part of the country. Angus Wilson is best known for his expertise in seabirds and marine mammals. His website "Ocean Wanderers" is a wealth of information on the topic. 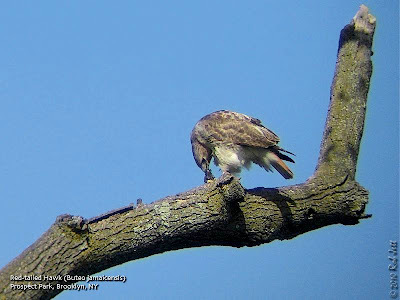 Angus also maintains a great blog called "Birding to the End", which covers birding along the south shore of Long Island. 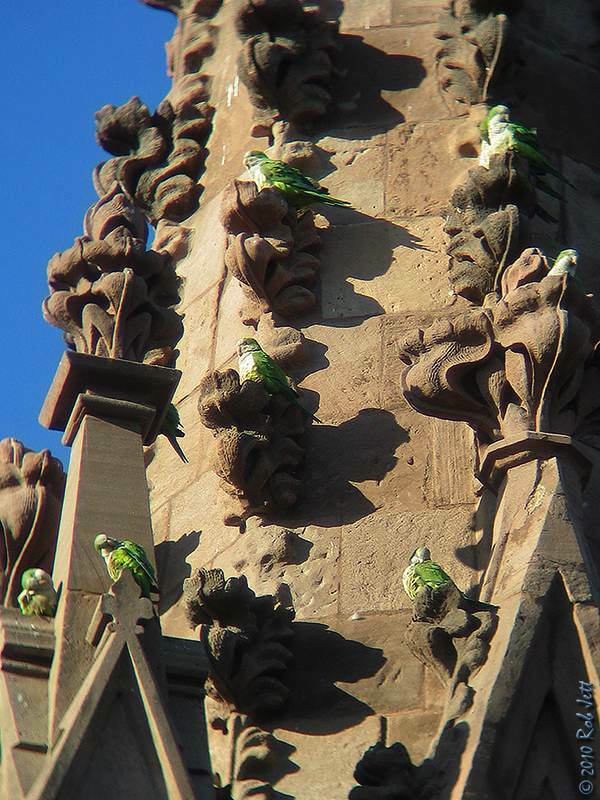 Monk Parakeets sunbathing on the entrance to Green-Wood Cemetery. Paige emailed me the other day. She mentioned doing some birding over the weekend in Green-Wood Cemetery and listed some of the species. It included a Red-eyed Vireo, which piqued my interest. Red-eyed Vireos aren't particularly rare in New York City on migration, in fact, some breed in our city parks. What is unusual is for one to show up in March as they generally don't begin to arrive until May (although they are rare in late-April). Anyway, I didn't doubt that Paige saw a vireo as she is a good birder, but more often than not, an off-schedule migrant ends up being a vagrant from another part of the country. There are likely several reasons for anomalous bird movements, but weather patterns are thought to be one factor. When walking in Green-Wood Cemetery I try to take a route along the tops of the north-south ridges. The area where Paige saw the vireo is just below a ridge called Ocean Hill in a section called the "Flats". It is on the opposite side of the cemetery from where I entered. I took my time getting there, taking photos of flowers along the way and carefully scanning any flocks of songbirds encountered. I had just passed Samuel B. Morse's monument when I received a text from Peter Dorosh about a sighting of two Black Vultures over Prospect Park. Unlike Turkey Vultures, which are seen regularly on migration, Black Vultures are quite rare, in fact, I've never seen one in New York City. For reasons that are unclear, so far this year there have been four sightings of Black Vultures in Brooklyn ... none of them by me. When I read Peter's message, I thought, "Oh great, I've missed them again". Green-Wood Cemetery is a very short distance to the south of Prospect Park, so I guess I hadn't been looking up at the right time. Resigned to accepting my new jinx bird, I even received a text message a few minutes later from Heydi gently pointing out my "loser" status. I was still heading towards the "Flats" but decided to stick to areas where I could see large sections of sky. Right after the vulture sighting, Tommy, one of the cemetery's security guards, tracked me down. He said that there was a Bald Eagle eating a carp at the edge of the Sylvan Water. I have no reason to doubt Tommy, but a Bald Eagle seemed a little improbably, but so did three Black Vultures. When we arrived at the pond, he pointed out a beautiful Osprey perched in a mature sycamore maple. At least he got the head coloration correct ... kind of. I walked up to the top of an adjacent ridge and sat down below the Osprey hoping to take some flight photos. Well, I guess he was full from eating that huge fish, because he stayed on that branch for an hour and I had to settle for a photo of a sleepy, perched Osprey. With all the excitement, I nearly forgot the main reason why I went to the cemetery; to look for Paige's vireo. I actually did spend a long time searching the "Flats" and along the edge of Ocean Hill, but didn't find the vireo. The nice thing about birding, though, is that you never know what you'll stumble on when you start exploring your backyard. Note - Shai Mitra has an interesting discussion about the expansion of Black Vultures in New York on the NYS Birding list here. I finally had a chance to check out the progress at the Red-tailed Hawks nests in Prospect Park and Green-Wood Cemetery. Big Mama and Junior's massive nest in a towering linden tree in Green-Wood Cemetery has survived the snow storms and high winds of the last month and a half. The pair is now incubating eggs as of approximately one week ago. Marge witnessed an exchange at their nest last week. Last week Peter texted me from Prospect Park when he saw activity at the Ravine pine tree nest. That would be the annual nest for the pair I call Alice and Ralph. When I checked it out earlier this week, I saw Alice sitting in the nest. Quite a few trees have blown down in the vicinity of their nest and I'm hoping that, when the trees leaf out this year, viewing will be a little easier. This will be the ninth consecutive year that they have nested in the Ravine. Queens County has a new pair of residents. Please note that I am intentionally being vague about the exact location of this rare NYC breeding species. On Saturday I went to Queens looking for a pair of nesting Common Ravens. Ravens are not normally seen around New York City's five boroughs, but I did see one last year at Pelham Bay Park. I was told, at that time, that they are being seen more frequently in Westchester and that, presumably, some of those birds are venturing farther south. Historically, Common Ravens resided throughout the northern forests of eastern North America. As humans cleared most of the forests, the ravens disappeared from the northeast and much of New York. Presumably, they once nested in the New York City area and Long Island. As our forests have been allowed to return, it appears that the ravens have followed. There are now reports of ravens nesting on Long Island. 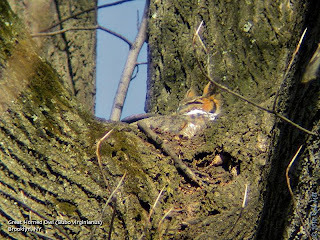 "The curious thing is that the recent colonizers in NJ (Palisades, Hackensack Meadows) and MA (along Rte 128) are nesting either on rocky cliffs (scarce on LI, and not too many Brooklyn) or on tall tower-like structures. [...] they seem to be avoiding bridges or buildings (because of the falcons?)." Ravens are extremely intelligent animals that I didn't think would be intimidated by any other bird. On the other hand, they may just be smart enough not to mess with a bird that can slam into them at 200mph. There is concern by some people that if ravens were to become more numerous in NYC that they could cause the decline of other species. One study seeks to reduce their numbers in the Mohave Desert because they are decimating Desert Tortoise populations. In any case, I used some of the available clues posted online to figure out the best spot to look for the ravens. This was quickly confirmed. The nest is hard to miss as it is a huge structure that could easily be mistaken for a hawk or eagle nest. At 8:30am there didn't seem to be anyone sitting on the nest, but we were pretty far away and I thought that, perhaps, one of the pair was just hunkered down in the deep twig and branch structure. We stuck around for an hour. Jeff and Anna met us there a little before 9:30am and within a few minutes, both the male and female raven flew into the nest with more building material. We watched as one carefully arranged the new material on the top of the nest. The second bird flew to an adjacent perch where he or she observed the work and croaked a few times. It's hard to say if there any eggs on the nest. Normally, someone would be incubating the eggs at all times, but it was so warm on Saturday that, perhaps, they felt safe leaving the nest alone for a little while. Here's a short video I shot of the ravens at the nest. March is a deceptive month. For birdwatchers, it is a time of expectations. Blackbirds, phoebes and a few other migrants begin to arrive in the northeast stirring memories of the annual influx of huge flocks of songbirds. While there is increasing activity within the natural world this month, songbird "fallouts" are still at least a month away. 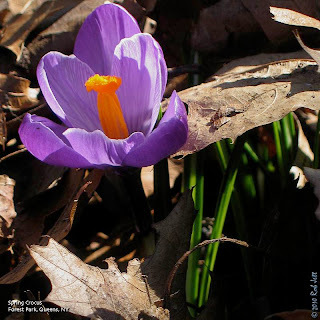 Red Maples are beginning to flower and crocuses are now sprouting virtually everywhere. Over the weekend I stopped at the Brooklyn Botanic Garden and found some species of azaleas have even flowered. Pussywillows are also in bloom with honey bees swarming the shrub's furry flowers. At the garden I followed my nose to a planting of Sweet Box shrubs. The honey-sweet fragrance had attracted honey bees, carpenter bees and a tiny fly that I didn't recognize. From the photograph, they looked like ants with wings. I searched through some of my field guides and learned that in some species of ants the reproductive castes actually do have wings. If you want to learn more about this large, complex group of insects there is a comprehensive website on North American ants here. One of this weekend's highlights was discovering an explosion of songs out at Floyd Bennett Field. Most of Floyd Bennett is grassland habitat with some wooded areas around the perimeter. In the northwestern section is a small, freshwater pond called the "Return a Gift Pond". While scanning the nearby cricket field for Horned Larks I heard a virtual din of chirping emanating from the direction of the pond. I assumed that it was recently awakened Spring Peepers, but I'd never heard so many or so loud. I walked over to the pond to check it out. What I found was amazing. Perhaps it was the results of the sudden warm spell that hit our area (it reached nearly 80 degrees on Saturday), but it sounded like there were thousands of Spring Peepers calling. Peepers are only about an inch long, but they make a huge sounds. I tried to home in on the source of one of these loud songs, so I could take a photograph, but was unsuccessful. I don't know why, but I try and fail every year. It makes me wonder how anyone photographs these mysterious frogs. 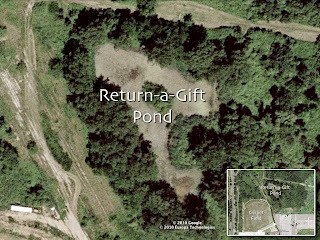 Below is a short video I shot at the Return a Gift Pond. Don't bother looking for the frogs, but make sure you turn up the volume on your computer before clicking play. Meet 10am at refuge visitor center. Start with a slide program and hike around the ponds and gardens to look for migrating birds and other signs of spring. Leaders: Andrew Baksh and Don Riepe. For reservations call (718) 318-9344; E-mail: driepe@nyc.rr.com. Saturday, March 27, 9 a.m. to 11 a.m.
Meet Howie Fischer in the parking lot opposite the Mt. Loretto CYO building and walk the fields to find winter species among the grasses and waves. These sparrows and waterfowl spend the winter here on Staten Island. Hopefully, we will find a variety of ducks in the ponds and bay, as well as geese, gulls, loons and grebes. Binoculars are recommended as well as comfortable walking shoes. Hawks may also surprise us if they are hunting the fields. 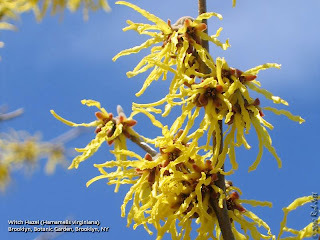 Sunday, March 28, 12 noon to 2 p.m.
We will look for evidence of the plants and animals of Spring as we survey the woodlands surrounding Long Pond. We’ll also observe migrating birds, examine the geology of the area and observe evidence of past human use during this unhurried stroll through about one and a half miles of the park. Meet at PS 6, on Page Avenue and Academy Avenue about 3 blocks NW of Hylan Blvd. Meet at NYBG parking lot. Bring the kids to the park for a day of birding by sight and song watching. Greetings. This is the New York Rare Bird Alert for Friday, March 19th, at 8:00 pm. The highlights of today's tape are MEW GULL, DOVEKIE, PARASITIC JAEGER, GLAUCOUS and ICELAND GULLS, and Spring arrivals. Early last Sunday afternoon, and adult MEW GULL was found roosting among a few hundred Ring-Billed Gulls on a field just before the entrance to the Read Sanctuary at Playland Park in Rye, Westchester County. The timing was a little after high tide, but the tide was very high that day. The gulls soon resettled along the Long Island Sound on the falling tide, and the MEW GULL could not be relocated. On Monday just before noon it did put in a brief high tide appearance on the same field, but has not been seen since. Field marks indicate that this was apparently the European subspecies known as 'Common Gull', but was probably not the same individual present along the Gravesend Bay waterfront in Brooklyn this winter. Among the good selection of water birds off Read Sanctuary this week have been two REDHEAD on Wednesday and a RED-NECKED GREBE on Thursday. Out on the South Fork Saturday during the storm, the best gulls were found on fields, with an adult GLAUCOUS GULL on Bridge Land in Sagaponack, and an immature GLAUCOUS and an adult ICELAND GULL along Further Lane in East Hampton. The Further Lane GLAUCOUS was present again on Sunday. On Sunday at Montauk Point a DOVEKIE flew into Turtle Cove just south of the Lighthouse before continuing on, and also at the Point were three RAZORBILLS, two adult ICELAND GULLS, and a subadult LESSER BLACK-BACKED GULL. Four TUNDRA SWANS were present Sunday in Sagaponack on fields between Sagg Main Street and Highland Terrace. An interesting report from Sunday mentioned an adult PARASITIC JAEGER around the ferry dock at Orient Point. A couple of ORANGE-CROWNED WARBLERS have shown up recently: one Thursday at Prospect Park around the Lullwater above the Terrace Bridge, and one Friday at Hempstead Lake State Park. On Wednesday six HARLEQUIN DUCKS were still around the Point Lookout jetties, and 93 COMMON EIDER continued in Jones Inlet. 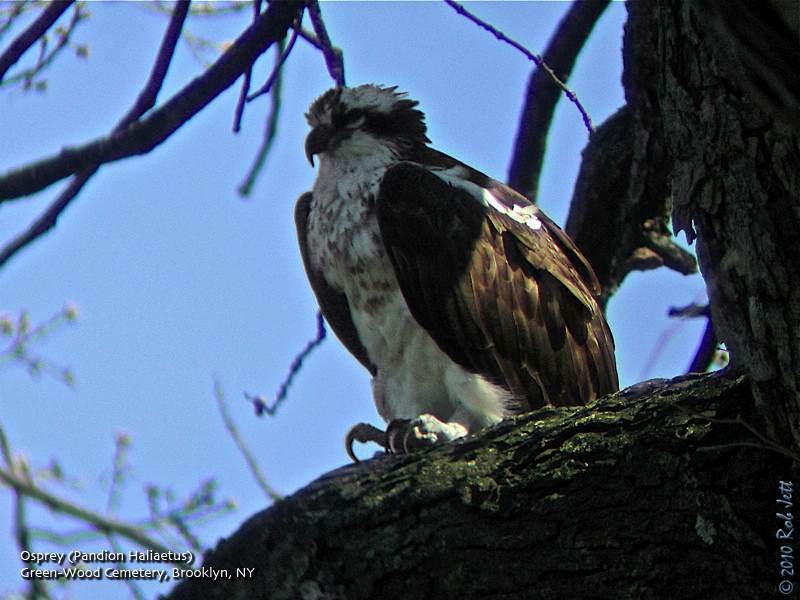 An arriving OSPREY was noted on eastern Long Island Monday, and being noted in an increasing number of locations have been some WOOD DUCKS, GREAT EGRETS, and AMERICAN OYSTERCATCHERS. Passerines being seen in city parks in low numbers as well as along the coast have included EASTERN PHOEBE, TREE SWALLOW, BROWN CREEPER, RUBY-CROWNED KINGLET, GOLDEN-CROWNED KINGLET, EASTERN BLUEBIRD, EASTERN MEADOWLARK, and RUSTY BLACKBIRD. To phone in reports on Long Island, call Tony Lauro at (631) 734-4126, or during the day except Sunday call Tom Burke at (212) 372-1483. 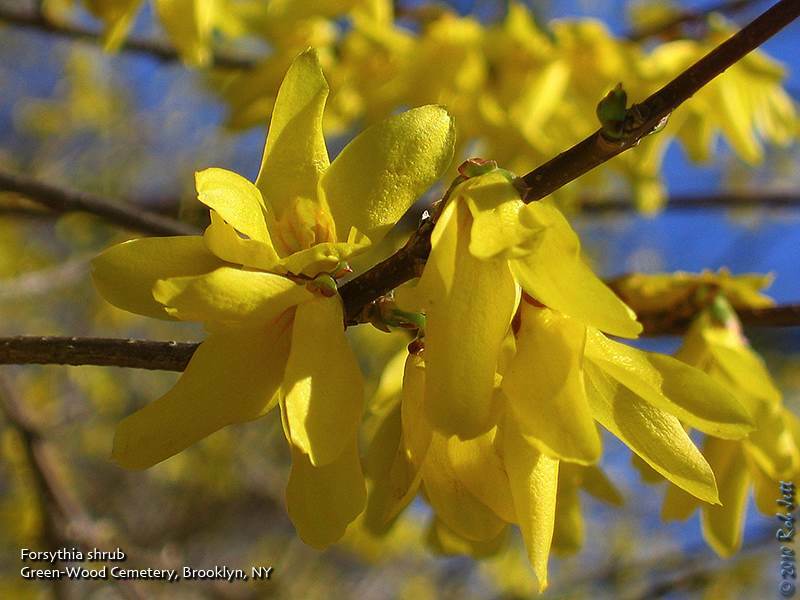 This service is sponsored by the Linnaean Society of New York and the National Audubon Society. Thank you for calling. 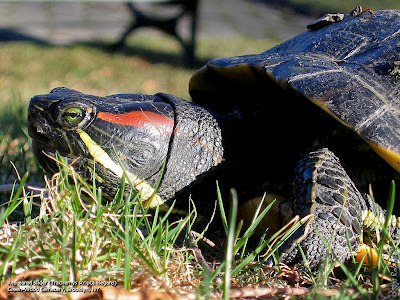 A sure sign that Spring has finally arrived: Red-eared Sliders basking in the sun around our urban ponds and lakes. Are the Hawks Following Me? Sometimes it seems like everywhere I go, there's a Red-tailed Hawk either perched nearby or one flying over my head. Maybe there are just a lot more of them around, or perhaps I'm more cognizant of them, but at times it sure seems weird. Take, for example, last night. Angus Wilson was giving a presentation on watching seabirds and cetaceans around New York. It was being hosted by the Queens County Bird Club at the Alley Pond Environmental Center in Queens. It's not an easy location to get to via public transportation, but Shane offered to give me a lift from the end of the "F" train line at Main Street and Roosevelt Avenue in Flushing. Main Street is a bustling commercial area that I hadn't visited in decades. 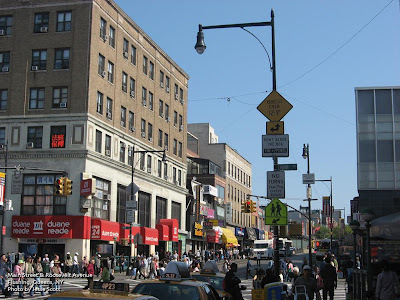 I grew up in Queens and Main Street was a major shopping destination. Suffice to say that it is the antithesis of, say, Forest Park. I felt strangely intimidated by crowded sidewalks and bumper to bumper street traffic. After fighting my way through crowds of commuters competing to enter or leave the subway station's way too narrow stairway, I stood on the corner of Main and Roosevelt, trying to orient myself. I attempted to stand behind a crosswalk signal's support pole and use it as a block against a constant flow of pedestrians. Heydi was meeting us there, as well, and I called her to find out where we would meet Shane. When I hung up the phone, I glanced across the street at a Duane Reade drugstore. A Red-tailed Hawk was perched on the corner of the roof. A moment later, it took off flying south along Main Street. Heydi walked up to me as I was watching the hawk and I quickly pointed it out before it disappeared behind Caldors. We both laughed. 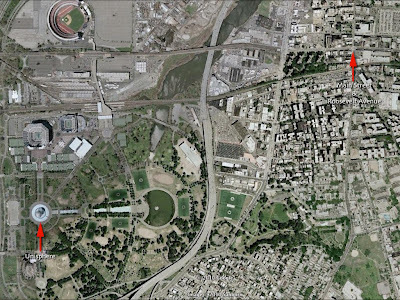 I thought that it was an unlikely neighborhood to find a red-tail until I looked at a satellite image of the area. Main Street is very close to Flushing Meadow Park, but more important, only about a mile from the Unisphere. It is within the steel girders of this remnant sculpture from the 1964 World's Fair that a pair of Red-tailed Hawks have successfully raised young for a few years. As unusual as it was to see hawks on Main Street, I supposed that even they have to make an occasional shopping trip for groceries. The noreaster that blew through New York City did more than damage trees. In Prospect Park over 50 trees were destroyed. Nearby, at Green-Wood Cemetery, the devastation was just as bad. In addition to the trees that were uprooted, many more had limbs torn from the trunk. It is the worse damage I've seen since Hurricane Donna, when I was a child. Meteorologists hadn't forecast such a powerful storm. Marge refers to it as "Hurricane No-name". Birding was out of the question this past weekend due to deluge rains and near gale-force winds. Sunday I did the next best thing and went to the New York Botanical Garden to see the Orchid Show. It was amazing and I highly recommend checking it out. It runs until April 11th. Saturday, March 20, 10 a.m. to 2 p.m.
Meet in the parking lot opposite the LaTourette Golf Club house at the top of the hill off Richmond Hill Road. We will remove invasive vines from trees on the steep portion of the co-joined Red and Blue Trails leading down to Historic Richmond Town. If you don’t have your own, Protectors will supply gloves and pruners (& refreshments). After a two hour work session (our 165th consecutive monthly workshop), we will take a short walk over nearby trails. Sunday, March 21, 12 noon to 2 p.m. Check for early spring risers, especially Skunk Cabbage, whose flower can make its own heat for bloom to occur. We will listen to the Spring Peepers, our very own native tree frogs. If we find one it will be a treat, because they are tiny, as small as a fingernail. They do, though, have a big “peep.” We will walk around the swamp and then into the upland. We will check the buds of trees to see if they are starting to open yet. Bring water and dress for the weather. Sunday, March 21, 5 p.m. to 7 p.m. Wander Great Kills Park at dusk with naturalist Cliff Hagen as he discusses and searches out the American Woodcock. 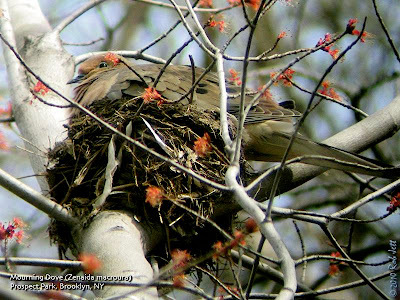 This common, though seldom seen bird, nests on Staten Island and begins courtship on this first weekend of Spring. A clear night sky will be filled with the sights and sounds of the Woodcock courtship ritual. We will meet in the parking lot at the corner of Buffalo St. and Hylan Blvd. The long, flat walk will grow dark as the sun sets so a flashlight will be needed. For directions or information call Cliff Hagen at (718)313-8591. Greetings. This is the New York Rare Bird Alert for Friday, March 12th, at 9:00 pm. The highlights of today's tape are THICK-BILLED MURRE, SNOWY OWLS, BARROW'S GOLDENEYE, EURASIAN GREEN-WINGED TEAL, GREATER WHITE-FRONTED GOOSE, and CACKLING GOOSE. With Spring finally showing some signs of actually arriving, northbound movement of migrants has also been noted. A sea watch off Montauk Point Sunday produced the most unusual of this week's birds when a THICK-BILLED MURRE was spotted moving east, joining 46 RAZORBILLS also flying by. An immature BLACK-LEGGED KITTIWAKE also appeared, and at Montauk Harbor Inlet, an ICELAND GULL was still present, and five more RAZORBILLS were noted. At Fort Pond Bay a LESSER BLACK-BACKED GULL continued, and a RED-SHOULDERED HAWK flew past. Rather unexpected, due to their notable absence this winter, were two SNOWY OWLS spotted recently. The first, a dark immature, was found last Saturday in the dunes near Tiana Beach, off Dune Road west of Shinnecock Inlet, a typical location, whereas the second, a lighter bird, appeared Tuesday in a farm field along Manor Lane in Southport on the North Fork. Both owls were searched for on subsequent days and not relocated. Lingering waterfowl included two BARROW'S GOLDENEYES. The drake in Bayville was noted Sunday, still off the entrance to Centre Island, which is east of Bayville along Bayville Avenue, while the drake at Jamaica Bay Wildlife Refuge continues in the Bay west of the West Pond or, especially in the later afternoon, on the West Pond. The numbers of GREEN-WINGED TEAL on the West Pond seem to be dropping, with the 'Common' type Teal pulling out, but another 'Eurasian' type GREEN-WINGED TEAL was found Sunday at Nissequogue River State Park, which is southeast of Sunken Meadow State Park, off Sunken Meadow Road. A CACKLING GOOSE was found at Caumsett State Park, north of Lloyd Harbor, on Monday. In conjunction with the continued sightings of COMMON RAVENS in Roslyn and occasional occurrences in New York City, it is quite interesting that a pair has been found nesting in Kew Gardens, Queens, at a site they apparently also used last year. Various spring migrants now appearing in Central, Prospect and other city parks lately have included WOOD DUCK and other waterfowl on the move; TURKEY VULTURES and some hawks, including a few RED-SHOULDERED HAWKS; KILLDEER and some AMERICAN WOODCOCK; EASTERN PHOEBE as of Wednesday; and some RUSTY BLACKBIRDS, along with many flocks of RED-WINGED BLACKBIRDS and COMMON GRACKLES. AMERICAN WOODCOCK are now displaying in most appropriate locations. Along the coast, GREAT EGRET and AMERICAN OYSTERCATCHER have also been noted, so a decent variety is now available. For example, the collection of birds at Shu Swamp in Mill Neck on Wednesday featured WOOD DUCK, AMERICAN WOODCOCK, WINTER WREN, HERMIT THRUSH and RUSTY BLACKBIRD. Out east at Shinnecock, two immature male HARLEQUIN DUCKS were still present along the inlet jetty Sunday, and Sunday afternoon several hundred COMMON EIDER flew out of Shinnecock Inlet to feed on the ocean. Birds along Dune Road west of the inlet included an AMERICAN BITTERN Saturday and EASTERN BLUEBIRD Sunday. A flock of NORTHERN BOBWHITE appeared Saturday near the old Grumman Airport in Calverton, where WOODCOCK were displaying on Sunday. Two nice birds up at the Bashakill Wildlife Management Area in upstate New York (Sullivan County) recently were a GOLDEN EAGLE joining up with some BALD EAGLES on the ice from about the 6th up to Wednesday, and a GREATER WHITE-FRONTED GOOSE visited Bashakill on Thursday. To phone in reports on Long Island, call Tony Lauro at (631) 734-4126, or days except Sunday call Tom Burke at (212) 372-1483. 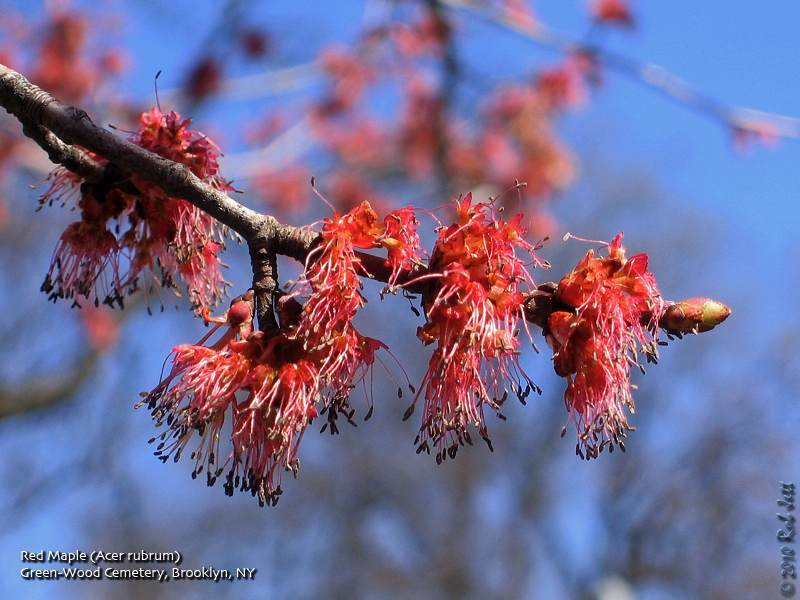 This service is sponsored by the Linnaean Society of New York and the National Audubon Society. Thank you for calling. Is it possible that we've finally seen an end to this winter's snow? As we approach the Vernal Equinox, changes in the plants and animals around the city have become more apparent. Over a period of just one week I've noticed an abrupt transition in emerging botanics, arriving migrants and early nesters. 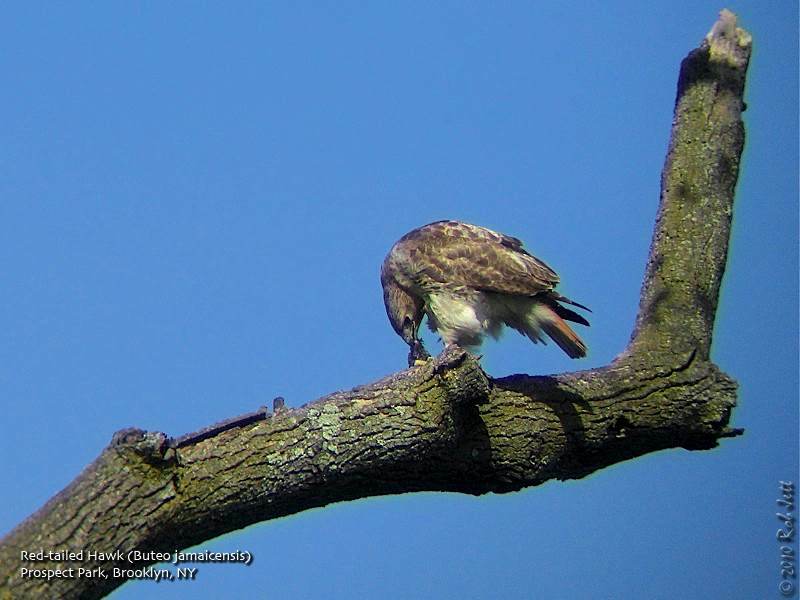 Last week I took a walk around Green-Wood Cemetery and Prospect Park to check on the hawks. Big Mama and Junior, the resident Red-tailed Hawks in the cemetery, were adding branches to their annual nest in a linden tree. Miraculously, the huge construction survived all of this past winter's snowstorms intact. Nelly and Max, Prospect Park's newest resident red-tails, were working on their nest at Nelly's Lawn. As of Tuesday, neither pair has begun incubating eggs. There also didn't seem to be any activity at the Ravine hawk nest. Bethany was in town for 5 days. I took off on Tuesday and we spent several hours hiking around Green-Wood Cemetery, Prospect Park and the Brooklyn Botanic Gardens. Unexpectedly warm weather had melted nearly all of the snow from our most recent storms. It felt like Spring and there was lots of activity in the air. Scaffolding that had been installed around the spires at the main entrance to the cemetery last Spring has finally been removed. Like workers on a tight schedule, the resident Monk Parakeets (who had been evicted from their huge nests) were working feverishly, rebuilding their nests on the sandstone towers. 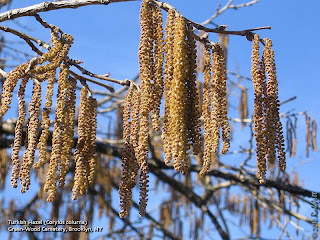 Ten minutes into our walk, I stopped to examine the flower catkins on a Turkish Hazel tree. It was on a ridge opposite the Pierpont family's hillside plot. After I took a few photos, we began walking towards the valley between the ridges. We had only taken a few steps and were startled by the sound of whistling wings as an American Woodcock flew from the leaves in front of us. Skittering just barely above the ground, the odd little bird came to rest a short distance up the hill, where we had great looks at this early migrant. Courtship displays have probably already commenced at their annual leks. The highlight of our walk was finding one of the Great Horned Owls sitting in a nest. We were really disappointed last year when the owl pair abandoned their nest. Marge and I eventually found out that one of the landscape workers scared the owls into leaving the eggs by parking his truck in front of the nest tree and honking the horn. This year's nest is in a better, more camouflaged location. Hopefully, people will have a little more common sense and leave the owls alone. I was thinking about mounting my Wingscape birdcam near the nest as a security precaution. Crocus, snowdrops, pussywillow and Witch Hazel were blooming throughout the Brooklyn Botanic Garden. 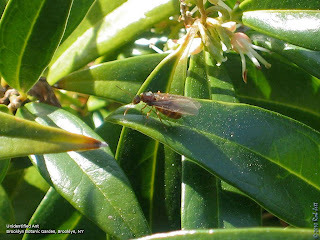 Tiny, indistinguishable insects hovered in tight clouds above the lawns and pathways. 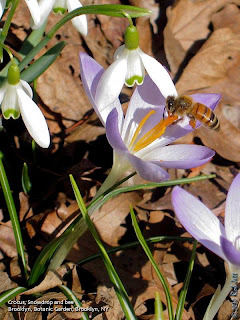 Crouching down to photograph crocuses, I noticed small, orange bees, possibly Honey Bees, enjoying the sudden abundance of nectar. Several Bee Flies were resting on the unfurling, fluffy flowers of a pussywillow shrub. There were a few Mourning Cloak butterflies flying around within the Botanic Garden. A harbinger of Spring in the northeast, I had seen my season's first this past Sunday in the cemetery. Saturday, March, 13, 11 a.m. to 1p.m. 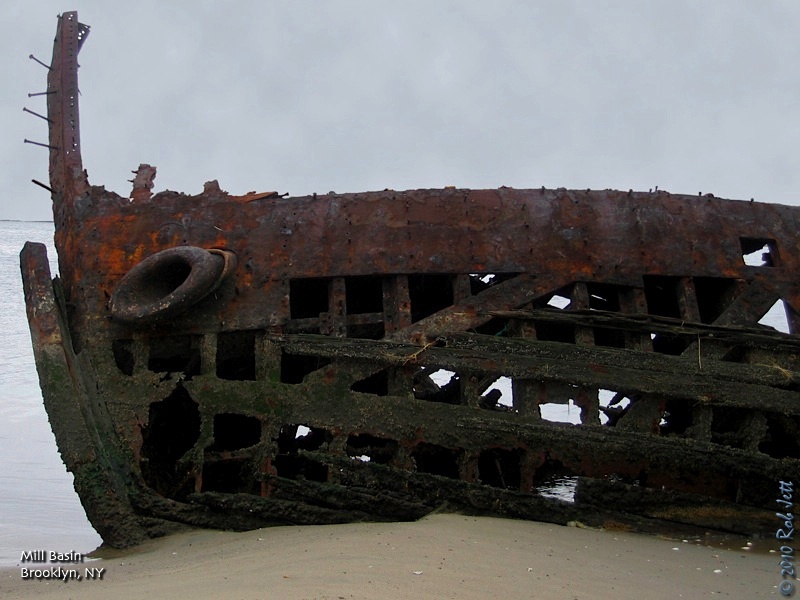 Join Sandra Mechanic, naturalist and photographer, to explore the unique challenging beach habitats of both dry and salty conditions for plants. We will find mostly last year’s dried plants including Winged Pigweed, Common Lambs quarters, evergreen Prickly Pear Cactus (native to Staten Island), Seaside Goldenrod, Sickle leafed Golden Asters, Dune grass, Salt marsh grass, the evergreen False Heather, Earth Stars (a kind of puff ball) and loads of sprouting Pinweeds that few recognize even when they are mature and flowering, but they are all over this area. We may see some winter bird visitors such as the snow buntings and horned larks on the open lawns along with our typical residents and many shore birds if the tide is low. Meet at the Hylan Blvd parking lot to Great Kills Park, Gateway, opposite Buffalo St, a stop on the #78 bus line. Drivers pick up passengers there at 10 a.m. then drive into the park about a mile to the first parking lot and park at the beach side in the first near corner to your left. If time permits, we will walk over to the educational building in front of which the Ranger Jackie Duhon and Protectors planted a Wildflower Garden with several hundred plants of 9 wildflower species, 4/14/07, the day before the eight inch rain storm. Bring water and a light snack. For more information phone Sandra Mechanic at (718) 967-1037. 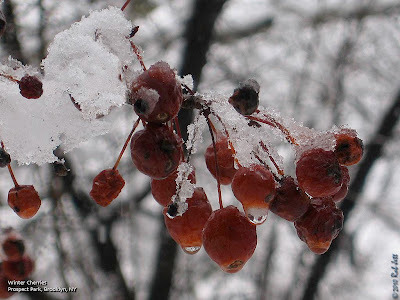 Learn how plants survive the cold winter months. Winter is the best time to see wild owls in New York City. Don’t miss this opportunity! Spring is just around the corner; let's see what is peeking through our forest. During a quick stroll around Prospect Park, I noticed that many of our winter birds are beginning to feel the pull of the season. By the end of the day I had discovered my new favorite bird vocalization. Red-winged Blackbirds and Common Grackles have been slowly arriving in Prospect Park for the last couple of weeks. The harsh ringing of these blackbirds filled the air along Breeze Hill and the Lullwater. "Konk-a-ree" and "kh-sheee", neither sound is very musical, but make me smile as they remind me of spring blooms and warmer weather. The park's overwintering Fox Sparrows, White-throated Sparrows and Dark-eyed Juncos have also begun warming up their voices. Much of the snow in the park has melted and the Fox Sparrow's slurred, finch-like song seemed to be proclaiming the end of winter. On Prospect Lake I spotted a male Hooded Merganser near the edge of Duck Island. He was performing a courtship display for a female tucked away and inconspicuous within a stand of reeds. With his bold black and white hood unfurled, the male shivered his head from side to side, then snapped it back, until his beak faced backwards. The bird was too far away from me to hear, but I could see his bill moving as he called out to his potential mate. When I returned home, I researched the vocalization of a courting Hooded Merganser. What I found was both surprising and amusing. When you listen to the clip below, keep in mind that one of the hooded's nicknames is "Frog Duck". Greetings. This is the New York Rare Bird Alert for Friday, March 5th 2010 at 7pm. The highlights of today's tape are WESTERN GREBE, MEW GULL, BARNACLE GOOSE, GREATER WHITE-FRONTED GOOSE, BARROW'S GOLDENEYE, HARLEQUIN DUCK and "EURASIAN" GREEN-WINGED TEAL. First, there have been no reports of the IVORY GULL in northern New York since Tuesday. Last Sunday, what would be the same WESTERN GREBE traveling around the coastlines of Brooklyn and Queens and perhaps also parts of northern New Jersey was spotted on the ocean off Riis Park. Resting much of the time the bird drifted west with the currents and was last seen moving past the Fisherman's parking lot at the West End of Fort Tilden and heading towards Breezy Point. The MEW GULL in Brooklyn was present today on the lawn just south of the pedestrian bridge that crosses over the Belt Parkway near Bay 16th Street where parking is usually available. It was seen just after noontime and if not there look along the Gravesend Bay shoreline from the promenade. At Jamaica Bay Wildlife Refuge the drake BARROW'S GOLDENEYE was on the West Pond later Sunday afternoon and seen again on the bay west of the West Pond on Thursday. There is an interesting gathering of GREEN-WINGED TEAL around the southwest corner of the West Pond at the bay. On Sunday, included among the 20 to 30 green-wingeds were one pure looking drake Eurasian form referred to as Common Teal and 2 other males showing characteristics of Common Teal. One however has very faint vestiges of the vertical white stripe on the side that is a character of American green-wings and the other has a more prominent vertical stripe but also features a slightly less than normal horizontal scapular stripe of a Common Teal. The later two would by appearance be presumed to be hybrids between the 2 forms of Green-winged Teal and who knows about the females present. These birds were all still present there on Thursday. 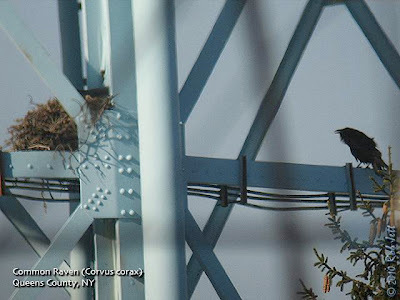 The 2 BLACK VULTURES, presumably setting up to nest again at Fort Wadsworth on Staten Island, were seen again Sunday spotted from the Brooklyn side of the Verrazzano Bridge. A BARNACLE GOOSE was found among Canadas at Sunken Meadow State Park on Tuesday near the main parking lot as this is likely the same Barnacle that was present there late last year keep an eye out also for the Pink-footed Goose to reappear there. Last Sunday 2 LAPLAND LONGSPURS were present with Horned Larks on a runway at Floyd Bennett Field and on Staten Island a LESSER BLACK-BACKED GULL was spotted at Silver Lake Park. 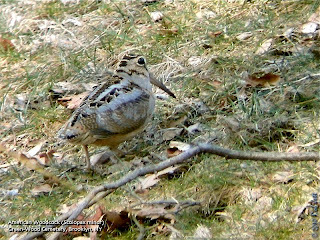 In Central Park AMERICAN WOODCOCK were appearing as of last Saturday and 4 EASTERN BLUEBIRDS were seen also on the move. While continuing as of today around Jones Inlet were 6 HARLEQUIN DUCKS around the Point Lookout jetties, 22 COMMON EIDER in the inlet and 3 LAPLAND LONGSPURS at West End these today off the southwest corner of the main West End 2 parking lot. An immature ICELAND GULL was also on the bar by the Coast Guard Station. A HARP SEAL, most amazingly, was seen along the beach going out to the West End jetty. At Smith Point County Park in Shirley a ROUGH-LEGGED HAWK was present Monday and a RED-NECKED GREBE was on the ocean Tuesday east of the parking lot. The 4 immature GREATER WHITE-FRONTED GEESE seen frequently along Further Lane during hunting season were found yesterday on a corn field along Route 114 next to a nursery in Easthampton. The 2 TRUMPETER SWANS remain on Upper Lake in Yaphank through yesterday. Birds at Croton Point Park last Sunday included the wintering ORANGE-CROWNED WARBLER in the first campground and 2 RED-SHOULDERED HAWKS.